System for the dismounted combat. Sagem’s innovative role in soldier modernization programs is aptly illustrated by its position as prime contractor in the French FELIN infantry modernization program and internationally in several programs of equipment of land forces. Company of Safran group, Sagem, proposes modular solutions that meet the changing needs of contact units: observation, detection, protection, weapons use, tactical information, target designation and air-land coordination. Lessons learned in combat operations combined with the advantages of innovations are today the crucial parameters in the solutions developed by Sagem for the future of infantry forces. 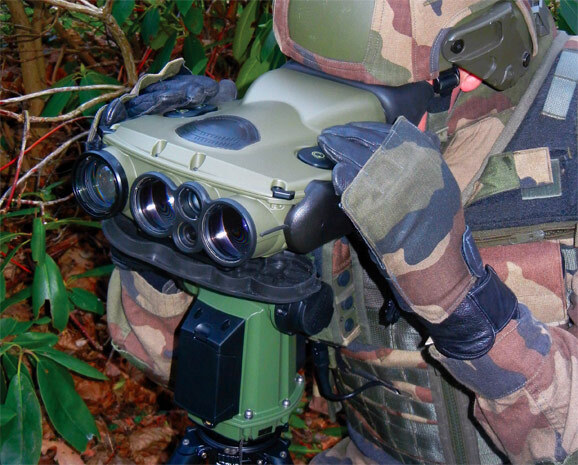 Sagem’s products capitalize on advanced technologies in optronics and navigation to multiply the capabilities of infantry forces operating day or night. Its optronic systems and equipment are designed to meet the multiple demands of forces: communication, protection, in-depth intelligence and action, long-range weapon operation; targeting missions by forward observers. Sagem’s modernization offer for international markets is made up of a range of latest-generation optronic equipment (mid-and long-range multifunction cameras, day/night assault rifle scope with IR or uncooled light-intensification technologies, longrange precision-rifle aiming sight). Sagem’s offer includes an around-the-corner solution to allow each soldier to observe or neutralize targets under protection from threats. In addition, Sagem develops tactical C4I solution at the section level, interoperable with superiors levels of command. For long-range observation and intelligence, Sagem developed JIM LR long-range multifunction infrared binoculars. JIM LR is used for both the identification and precise positioning of targets. A compact unit weighing just 3 kg, it integrates day vision, thermal vision, rangefinder, laser pointer, GPS and magnetic compass. The latest version has additional functions: video recording (2 hours, 30 minutes), day-night image fusion to see through camouflage, anti-glare function in the infrared band and a laser pointer with a range of 2,500 meters. It offers run-time of 4 hours 45 minutes on a battery charge, and delivers enhanced reconnaissance and identification performance. More than 5,000 JIM LR units are now in service or on order, including 2,000 with French armed forces. It has also been ordered by several NATO forces, namely the United States, Denmark, Poland and the United Kingdom. A JIM LR infrared multifunction binocular combined with the STERNA precision target location system, developed by Sagem and its subsidiary Vectronix. Ultralight, man-portable system <4 kg (<9lbs) STERNA’s lightweight structure makes it easy to carry and deploy, with no extensive bolt-ons required to operate the unit. 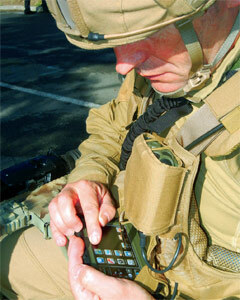 The man-portable capability of the STERNA enables the soldier to move at the same pace as his dismounted team. Photo: © Ph Wodka-Gallien - Sagem. To meet the needs of units that must operate under total silence, Sagem offers the JIM UC (uncooled) version. JIM UC binoculars offers all the features of JIM LR, but with an uncooled infrared detector. Deployed by advancing units, these binoculars provide an overall view of the threat environment in real time. They offer sophisticated image processing and very good resolution: the ability to detect an armored vehicle at more than 5 km, and a soldier at more than 3 km. All JIM binoculars, whether LR or UC versions, can be remotely operated from a special terminal, and can also be integrated in combat networks via their interfaces. In line with the FELIN soldier modernization program, now in full series production for France, Sagem has developed a wide range of sights (Sword family) that allow soldiers carrying collective weapons such as precision rifles, light machine guns, etc. to carry out nighttime precision firing at ranges up to 850 meters. A new version of this product, Sword Light, combines a compact design, long run-time and wide field-of-view, giving infantry soldiers reconnaissance and attack ability out to a range of 400 meters at night against enemy soldiers, while continuing to advance. Sword Light is ideally suited to special commando operations behind enemy lines. The performance of JIM LR binoculars can be enhanced by being used in conjunction with Sterna, a brand-new target location system. Developed jointly by Sagem and its Swiss subsidiary Vectronix, Sterna’s performance is based on the innovative hemispherical resonator gyro (GRH), a technology patented by Sagem. Used in conjunction with the measurements by JIM LR or any other rangefinding binoculars, Sterna extracts precise target coordinates. Weighing less than 3 kg, Sterna was also designed with the special weight and energy requirements of forward observers in mind, since they operate in severe environments and can’t count on much supply support.